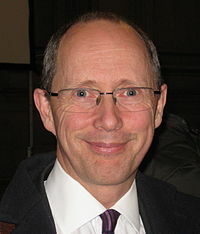 Sir Andrew William Dilnot, CBE (born 19 June 1960) is a British economist and broadcaster. He was formerly the Director of the Institute for Fiscal Studies from 1991 to 2002, and was Principal of St Hugh's College, Oxford between 2002 and 2012. As of September 2012 he is Warden of Nuffield College, Oxford. He took up post as Chair of the UK Statistics Authority in April 2012. Dilnot was born in Swansea and attended Olchfa School, a local comprehensive school. He studied PPE at St John's College, Oxford. Dilnot was Director of the Institute for Fiscal Studies from 1991 to 2002. Dilnot was a presenter on BBC Radio 4's programme about statistics More or Less. Many of the items on the programme deal with the misuse and fabrication of statistics. Dilnot and Michael Blastland wrote The Tiger That Isn't, which was based on More or Less. Dilnot became Principal of St Hugh's College in 2002, becoming the only principal of an Oxford College educated at a comprehensive school. He became a Pro Vice-Chancellor of Oxford University in 2005. On 16 March 2011, it was announced that "with very mixed emotions" Dilnot will leave St Hugh's College in September 2012 to become the Warden of Nuffield College, Oxford, "which will allow me to spend much more time doing economics again." In 2011, the government nominated Dilnot to be the Chair of the UK Statistics Authority. Parliament formally endorsed the appointment on 13 December 2011. Andrew Dilnot is now the former chair of the UK Statistics Authority, having stood down in 2017. In June 2010, Dilnot was asked by the government to chair the Commission on Funding of Care and Support. He took a sabbatical from St Hugh's College from March to July 2011. The Commission published its report in July 2011. The Commission's primary recommendation was to limit individuals' contribution to social care costs to £35,000, after which the state would pay. Currently, individuals who do not fit means-tested criteria can be liable for unlimited costs. The Commission's report was welcomed by Health Secretary Andrew Lansley, and both David Cameron and Ed Miliband called for cross-party talks on the issue. Dilnot was appointed Commander of the Order of the British Empire (CBE) in 2000 and knighted in the 2013 Birthday Honours for services to Economics and Economic Policy. He is an Honorary Fellow of St John’s College, Oxford, Queen Mary, University of London, the Swansea Institute of Higher Education and the Institute of Actuaries, and holds an Honorary Doctorate from City University and the Open University. ^ "Index entry". FreeBMD. ONS. Retrieved 12 June 2017. ^ "St Hugh's College - University of Oxford". St Hugh's College, Oxford. Archived from the original on 20 January 2011. ^ "BBC NEWS - Programmes - More Or Less - More or Less presenter Andrew Dilnot". news.bbc.co.uk. ^ "Message from the Principal, Andrew Dilnot CBE". St Hugh's College, Oxford. Retrieved 19 April 2012. ^ "Andrew Dilnot appointed new Warden of Nuffield College". Nuffield Foundation. 24 March 2011. ^ Foundation, Internet Memory. "[ARCHIVED CONTENT] UK Government Web Archive – The National Archives". www.dilnotcommission.dh.gov.uk. ^ "David Cameron and Ed Miliband seek talks over Andrew Dilnot care report". Metro. 4 July 2011. ^ "No. 55879". The London Gazette (Supplement). 19 June 2000. p. 8.